The week ran vivid, surreal, inevitable. The woman lives alone. One Saturday morning she got dressed and put a knife in her purse. So many years had passed since they met. The leaves were just coming out of the buds. A large rift opened in the ground, leaving jagged sidewalks, mud and moist, shrouded apologies rendered useless. The man lived alone in the old church. The church was in the West End, over grown now. A shaggy pine stood hiding her. She was a young, no more than sixteen and very pretty. He whistled an old Praise Song. “My Mama used to sing this song, but I cannot remember the name.” He beamed as the face of his guest registered surprise. “I just bet.” She turned and walked away. He listened to the throaty grumbles from the tugs as they struggled upstream. The low hills were covered with green pines and a 700 year old cannon. The gate stood open, it’s rusting frame caught in the mud of the path. The woman walked in. “I don’t think you’ve spoken to me twice.” she said, watching the roof sparkle in the sunshine. She scrapped the mud from her shoe. Sieges are history but the canons remain. Two brothers in a shack. One builds a fire in the stove. The air was filled with smoke. A pile of magazines sat on the floor. Should he subscribe? What purpose would it serve? Better to create one of his own. They belonged to his brother who sat drinking in the corner. “Is there any of that chili left?” he said rummaging through the icebox. Clouds slid away and sunlight poured through the window, through the frozen silence in the room. he wished he could trade those words for others. Create a different day. He waited, drawing into himself. The blood roaring in his ears. A dog, one light eye, began to plow. outside snow falls. A dog, one light eye, starts to plow through. Geese fly south. registered surprise. “Please don’t hurt me,” he started. Sieges are history but the cannons remain. The air was filled with smoke. Outside wind and snow blow, roar over the dog, his one light eye gleams, his strength gone, he can see. The geese fly south. I wrote this poem using words/phrases from a news article in the Baldwin Star on March 1, 1998. 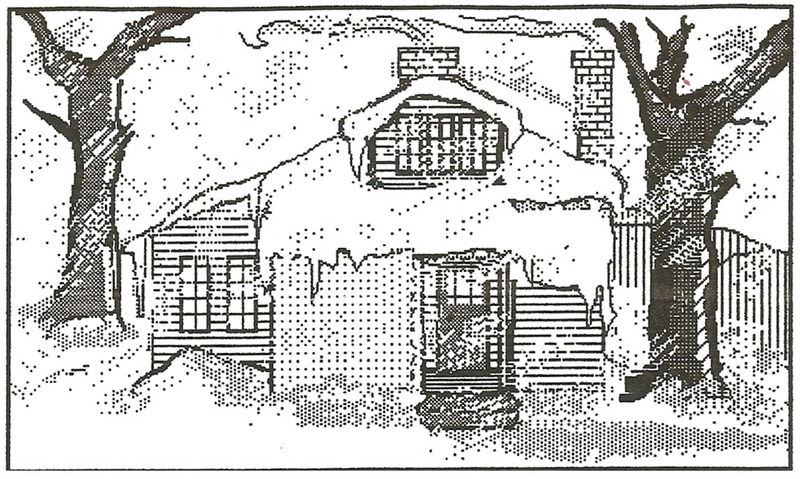 Computer drawing of the Idlewild house. making it white and clean. The world is filled with confusion. I found this story in an old notebook. I don’t remember where it came from but it had to include the following: A flood, basement, a girl named Julia who likes to walk backwards, a big boy with black eyes named Bill, age 11. Bill stood on the back porch watching the river. It was higher than usual because all the snow was melting and it had been raining for a week. His black eyes shone as he thought about riding out a flood in his new boat. It was a big one, for a row boat, and he’d waited all winter for the ice to melt – but a real flood! “Wow!” he thought “That would be exciting.” He turned to go back into his basement, he’d never gotten around to building the rest of the house so he lived in the basement. When he saw Julia walking backwards down the road. So, they got the boat out of the garage, piled in a bunch of food, pushed off into the flooded river and rowed away. I call to my husband.